← Should Paul Walker’s Death Serve as a Warning? 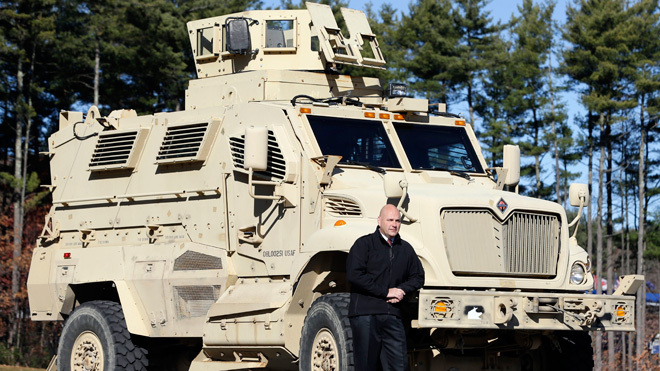 QUEENSBURY, N.Y. – Coming soon to your local sheriff: 18-ton, armor-protected military fighting vehicles with gun turrets and bulletproof glass that were once the U.S. answer to roadside bombs during the Iraq war. But the trucks have limits. They are too big to travel on some bridges and roads and have a tendency to be tippy on uneven ground. And then there’s some cost of retrofitting them for civilian use and fueling the 36,000-pound behemoths that get about 5 miles to the gallon. An Associated Press investigation of the Defense Department military surplus program this year found that a disproportionate share of the $4.2 billion worth of property distributed since 1990 — everything from blankets to bayonets and Humvees — has been obtained by police and sheriff’s departments in rural areas with few officers and little crime. Ohio State University campus police got one, saying they would use it in large-scale emergencies and to provide a police presence on football game days. Others went to police in High Springs, Fla., and the sheriff’s office in Dallas County, Texas. In Boise, Idaho, police reported using their MRAP two weeks ago to serve a warrant, saying they had evidence the suspect might be heavily armed and have explosives. Authorities said they found 100 pounds of bomb-making material and two guns. A second MRAP from nearby Nampa’s police department was used to shield officers and neighbors from a possible explosion. In New York, the Albany County sheriff’s department already had four smaller military-surplus Humvees, which have been used for storm evacuations and to pull trees out of roadways. The new MRAP truck will go into service after technicians remove the gun turret and change the paint from military sand to civilian black. Sheriff Apple rejected the idea that the nation’s police forces are becoming too militaristic. 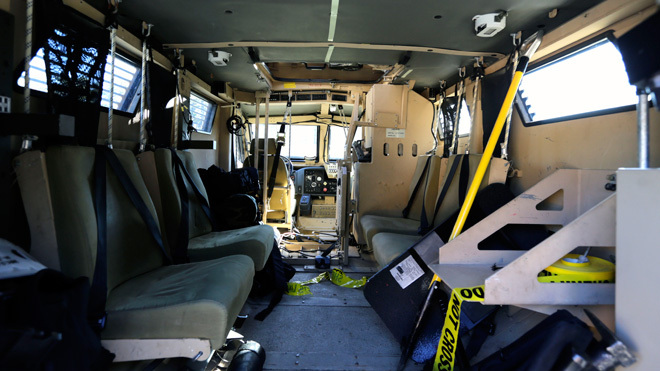 In Warren County, at the southern edge of the Adirondack Mountains, Undersheriff Shawn Lamouree said its MRAP, which can hold six people and reach 65 mph, will have its turret closed up except for a small slot, the only place to fire a gun. Its bulletproof windows don’t open. The proposed retrofit, including new seating, loudspeakers and emergency lights, would cost an estimated $70,000. The department has applied for grants. While Warren County’s Lamouree acknowledged the MRAP will likely spend most of its time in a heated garage, with “minimal” maintenance costs, it could be used occasionally by the emergency response team, which has used armored vehicles to serve drug warrants. Others in New York that got big armored trucks included sheriff’s departments in Jefferson County, Steuben County and Sullivan County, and police in Nassau County, Plattsburgh and Hamburg Village. Police departments statewide have also acquired almost 150 other trucks and Humvees, a dozen of them armored, over the past two years.